Artists around the nation are being sought by the United States Mint to create designs for the commemorative 2018 World War I American Veterans Centennial Silver Dollar. A design competition has been established with American citizens and permanent residents 18 years of age and older eligible to participate. The top prize for the winner is $10,000. Plus, his/her initials will be placed on the coins. 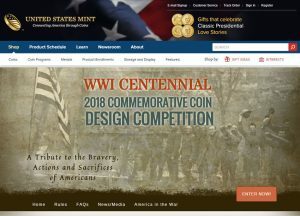 "This competition affords American artists a rare occasion to design a coin that will preserve an important time in American history and pay tribute to the bravery, actions, and sacrifices that were so critical to the final outcome," Rhett Jeppson, Principal Deputy Director United States Mint, said in a news release on Mar. 1. Congress authorized the design competition with the passage of the World War I American Veterans Centennial Commemorative Coin Act. Enacted in December 2014, it requires an expert jury consisting of the Secretary of the Treasury and three members from the Citizens Coinage Advisory Committee and three members from the Commission of Fine Arts to select the winning designs. The first phase of the competition opened Monday, Feb. 29, and lasts until Apr. 28, 2016. During this time, artists are asked to submit portfolios of their prior work. Up to twenty of the Phase One applicants will be selected to participate in Phase Two. These artists will be paid a stipend of $1,000 to create both an obverse (heads side) and reverse (tail side) design with accompanying plaster models. "There have only been a handful of open design competitions in modern history in which the Mint has called upon the public to submit designs for a coin," the U.S. Mint notes. "Most recently, the Mint held a competition in 2013 for the design of the reverse image for the Baseball Hall of Fame Commemorative Coin Program." Phase Two participants will be notified on or about May 31, 2016. From that date, they will have 60 days to complete and submit their work. The winner will be announced in January 2017. World War I Centennial Commemorative Coins will be issued in 2018 to mark the 100th anniversary of the signing of the armistice with Germany. Up to 350,000 silver dollars in collector proof and uncirculated qualities will be sold. Surcharges of $10 are to be collected on the sale of each coin with proceeds, after associated costs, paid to the United States Foundation for the Commemoration of the World Wars (Foundation) to assist in the funding of the National World War I Memorial in Washington. For more information, the U.S. Mint has a webpage devoted to the WWI Centennial Design Competition.